As news came through on Backyard and Beyond’s blog that the 17 year Cicadas were emerging on the eastern seaboard of the United States, there were insects emerging in our own small patch of Hertfordshire. Whether you are paddling in a river or walking through open countryside, it is always worth looking carefully under stones or logs to see what lurks in the shade, out of harms way. Gardens are no different, though pebbles are replaced by plant pots. And so it was, as we tidied our patio in glorious sunshine, that the lifting of a pot that sat on a tree stump revealed the emergence of these Wasp beetles. 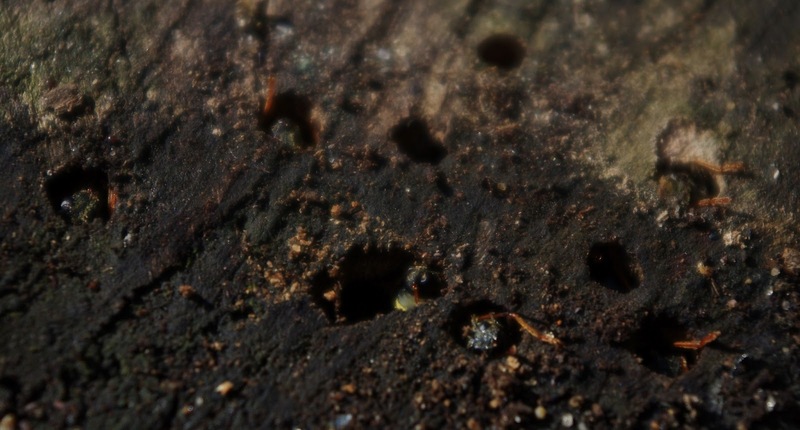 An initial wriggling movement in tiny bore holes betrayed the insects beneath. Flicking brown antennae and the purchase of forelegs on the lip pulled them from the wood that had provided their home since they emerged from their eggs into larvae. Each beetle, once out into the open, took a few moments on the tree stump to find it’s feet before moving off into the environment. Wasp beetles are a common insect to the UK. Entirely harmless, they use mimicry as protection, both in their colouring and in their erratic flying movements reminiscent of wasps. Wasp beetles feed on pollen and nectar and can be seen from late spring to early summer crawling across flower heads. 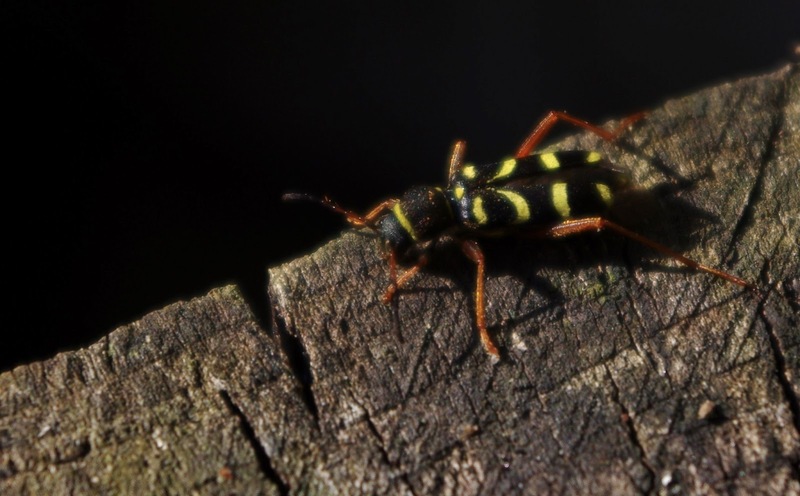 Clytus arietis, Wasp beetle. Bookmark.